Options * Quarter Package: ROCKETFRAME COMPOSITE WITH L1TEFRAME 360 TECHNOLOGY – One-piece boot frame offering a 360-level Have compatibility and an unprecedented direct energy switch system. * Have compatibility: TAPERED FIT – Supplies players with a detailed, 360-level tapered Have compatibility around and below the foot. * Core: SPEEDCORE 3 – Super light-weight, rigid and thermo-formable core producing final efficiency. * Liner: TOTALDRI PRO LINER WITH DURAZONE ABRASION PROTECTION – Prime efficiency moisture-wicking subject material helps to keep feet dry and skates mild. * Comfort Pad: SMOOTH CONTOUR PRO – Cushy pad around collar of the boot for superb foot and ankle comfort. * Ankle Padding: MULTI-DENSITY MEMORY FOAM – Symmetrical foam comfort pads wrap around player’s foot for custom designed Have compatibility and luxury. * Tongue: TRITECH TONGUE WITH MOLDED LACE-BITE PROTECTION – Molded to players’ feet and Prime ankles, with enhanced lace-bite coverage. * Midsole: LIGHTWEIGHT COMPOSITE MIDSOLE – Enhanced energy switch platform for blade to boot interface. 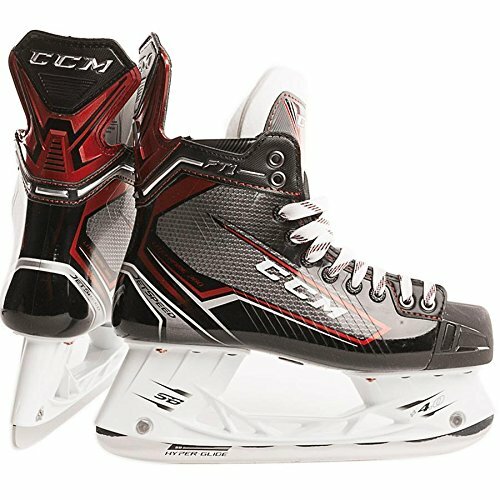 * Footbed: CCM CUSTOM FOOTBED (POWERED BY CURREXSOLE) – Custom designed arch improve Supplies an increased house of contact with the skate for maximized efficiency. * Holder: SPEEDBLADE 4.0 – Proven sturdiness with increased attack perspective offering greater strides and cornering. * Runner: SPEEDBLADE HYPERGLIDE – Prime efficiency polished steel blade for greater flow potency and an extended edge existence.